Han Chong Hung sampled the food at last year's Korean Festival. The 2007 fest takes place Saturday. 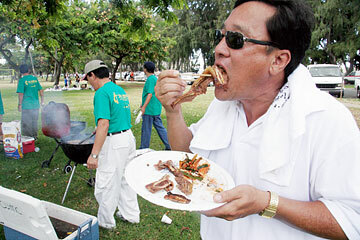 The Electric Kitchen / Hawaiian Electric Co.
FESTIVAL GOERS will "See, Taste, Listen Korea!" at the 6th Annual Korean Festival on Saturday at Kapiolani Park. The event will feature Korean music, dance, food, cultural displays and family activities, as well as Korean-made and local products. Other anticipated highlights include Korean cooking demonstrations, kim-chee eating contest, a Korean Youth Singing Contest, and all-day entertainment and performances by local Korean dance studios and others. Scrip will be sold for foods, products and some activities. The Korean Festival is one of the largest and most vibrant ethnic festivals in Hawaii, attracting tens of thousands of Hawaii residents and visitors. The festival also unites the community as more than 400 volunteers representing 40-plus Korean and local organizations support the one-day event. To get you in the mood for the festival, organizers shared these recipes. The Korean Style BBQ short ribs come from Seoul Jung Restaurant at the Waikiki Resort Hotel. Don't be put off by the large quantities in the recipe -- you can make up a batch of sauce and use about a fourth of it to marinate 4 or 5 pounds of ribs -- enough for 4 hungry people or 6 average appetites. Freeze any unused sauce for future use. The Squash Jun is sure to be a family favorite -- it's great as an appetizer, side dish, or main dish. In a large pot, combine soy sauce, water or beef stock, green onion, round onion, garlic, pear, apple, pineapple, malt or corn syrup, and brown or black sugar. Bring to a boil; reduce heat and simmer until the fruits and vegetable are tender, about 30 minutes. Drain, removing fruits and vegetables and let sauce cool to room temperature. Add sesame oil, mirin, and sake; mix well. Marinate ribs in sauce at least 6 hours, until meat is as dark as soy sauce. Grill or broil to desired doneness. Serves 22. Notes: Amount of sugar can be adjusted according to taste. If making a smaller amount of ribs, freeze extra sauce. About 1/4 of the recipe is good for 4 to 5 pounds of meat. Approximate nutritional analysis, per serving (assumes half of marinade is absorbed into meat): 920 calories, 68 g total fat, 27 g saturated fat, 150 mg cholesterol, greater than 2,000 mg sodium, 32 g carbohydrate, 1 g fiber, 16 g sugar, 38 g protein. Slice zucchini into 1/4-inch thick slices; lightly sprinkle with salt. Squeeze excess water from tofu. Mix tofu, ground beef, 1 egg, green onion, garlic and remaining salt. Place a spoonful of beef mixture onto slice of zucchini; dredge in flour and dip in beaten eggs. Pan-fry on medium heat, until browned on both sides. Combine sauce ingredients. To serve, garnish with red pepper and serve with dipping sauce. Serves 4. Approximate nutritional analysis, per serving: 300 calories, 22 g total fat, 4 g saturated fat, 65 mg cholesterol, greater than 3,000 mg sodium, 13 g carbohydrate, 3 g fiber, 3 g sugar, 16 g protein.